The new museum honors local history and the Hudson Valley’s international roots. The Reher Center for Immigrant Culture and History is a museum in the making. The process of transformation began in 2002 when Ulster County historian Geoffrey Miller was researching Jewish history in Kingston’s Rondout neighborhood. Looking at the abandoned Reher Bakery on Lower Broadway, Miller had a vision of what the building might be. The dusty store with its yellowing newspapers was a time capsule, untouched since it was shuttered in 1980, a victim of the urban renewal that demolished much of the neighborhood. At the time the building was home to Hymie Reher, one of the six children of Frank and Ada Reher, East European immigrants, who opened the bakery in 1908. The building was due to be auctioned for back taxes before Reher was convinced to donate it to the Jewish Federation of Ulster County, which paid the taxes. At first Miller envisioned it as a Jewish museum, with offices and perhaps a rental space, but after visiting New York City’s Tenement Museum, he broadened his focus. The bakery fed a community, which at the time included Irish, Italian, German, and Polish immigrants. Two generations of the Reher family worked in the bakery, braiding challah dough, forming round hard rolls, baking fragrant loaves of pumpernickel and rye bread, neatly packaging rolls in brown paper bags for pick-up, or delivering bread directly to the dinner tables of families out attending Sunday services. The days when the Rehers fed the Rondout community were not completely forgotten. Examining store artifacts, Litvin found a fading list, which noted the families that would pick up rolls on Sunday. After posting a photo of the list on social media, Kingston residents shared memories of the bakery or deliveries by Hymie’s brother, Willie. Plans for the shop include recapturing some 50s nostalgia. Eventually the currently forlorn and tarnished shop walls will be refurbished and the shelves stocked with staples carried there in the 50s, as seen in old photographs. For over a decade, most of the funds raised for the project went to repair the building’s structural problems, caused mostly by water damage. Progress was almost invisible. This July the museum finally gave its first tours and hosted an exhibit in the new gallery space above the store. Visitors can tour the the shop, which is still a work in progress, and the actual bakery, with its vintage dough mixers and oven trays patterned with trace images of long ago rolls. The bakery also contains a massive coal-fired oven, purchased in 1916, an oven Litvin says never got cold. 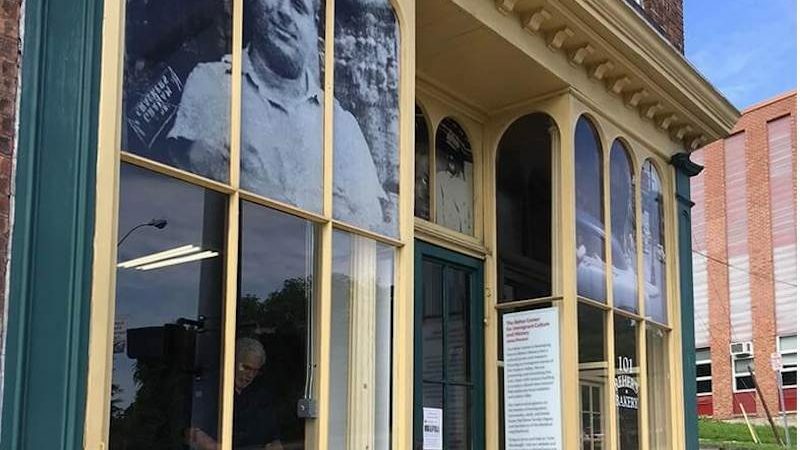 The center’s gallery currently showcases Rondout history and “The Story Continues: Portraits of Today’s Immigrant Businesses,” focusing on contemporary immigrant business owners who live and work in the Rondout. After walking up Broadway and visiting shops, visitors can learn the history of all the buildings they visited. In September the gallery will host an exhibit by Phil Mansfield, staff photographer for the Culinary Institute of America, focusing on the bakery’s third floor rental apartment, untouched since the 1950s. “It will be all about living above the store,” says Litvin. The center is open to various uses, depending on what the community wants or needs it to be. “It’s about creating a place in the community where people feel comfortable and it’s safe to have discussions, to be comfortable breaking bread together, regardless of their backgrounds,” says Miller. Since the museum is a work in progress check the site for opening hours. When funding permits, Litvin says hours will expand to meet community need.